The Beighton score is a popular screening technique for hypermobility. This is a nine – point scale and requires the performance of 5 maneuvers, four passive bilateral and one active unilateral performance. It was originally introduced for epidemiological studies involving the recognition of hypermobility in populations. Therefore the scale was well suited, being easy and quick to perform in large numbers of people . The criteria of the Beighton score were the first used to recognize hypermobility, and this method has been in use for 30 years. It involves evaluation of only a few joints and does not include other involved systems . The Beighton score is a modification of the Carter and Wilkinson scoring system (1964) . Because passive extension of the fingers was too severe, it was replaced by passive extension of just the little finger beyond 90° with the forearm flat on a table . It samples only a small number of joints for examination, so that hypermobile joints outside this selected group will inevitably and invariably be overlooked. 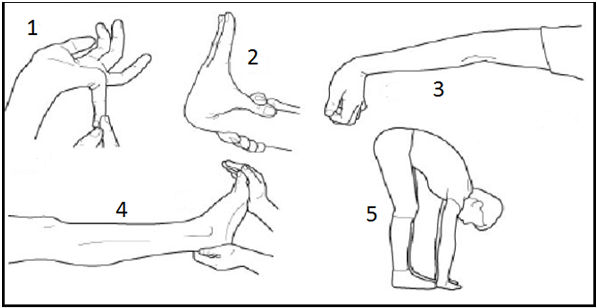 Beighton and Horan (1969) revised the test to measure joint laxity in people with Ehlers – Danlos syndrome . The first four elements can be given a maximum score of 2, because these are performed bilateral. The last element is scored with 0 or 1. The maximum score for ligament laxity is 9. A score of 9 means hyperlax. A score of zero is tight. Several researchers appoint a score of 0-3 as normal and a score of 4-9 as representing ligamentous laxity (Al - Rawi et al 1985, Diaz et al 1993, Klemp et al 1984). According to child (1986), a score of 4 or more out of 9 indicates generalized hypermobility of the joints .The spinal forward flexion criterion differs from the other criteria, in that it measures hamstring flexibility and anatomic proportions to ligamentous laxity . According to the Beighton and Horan criteria, generalized joint laxity is present when four or more of five tests are positive, including contralateral knee hyperextension . In fact there is no universal agreement on a threshold for BJHMS, some researchers use a Beighton scale score of 5/9, other researchers use a score of 6/9 and still others use a modified score of 3/9 . According to Remvig et al., the Beighton and Horan method for diagnosis of generalized joint laxity showed high kappa values (intraobserver: 0.75; interobserver: 0.78) . Kyndall L. Boyle investigated the intrarater and interrater reliability of the Beighton and Horan Joint Mobility Index for women aged 15 to 45 years. His purpose was to determine the intrarater and interrater reliability of composite BHJMI scores (overall 0-9) and categorized scores (0-2, 3-4, 5-9). The percentage agreement and the Spearman rho for the intrarater and interrater reliability of the composite scores were 69% and 0.86 and 51% and 0.87, respectively. The percentage agreement and the Spearman rho for the intrarater and interrater reliability of the category scores were 81% and 0.81 and 89% and 0.75, respectively. This concluded that the reliability of BHJMI was good to excellent . There may be a need to devise a new, more specific assessment tool to evaluate joint laxity in the developing musculoskeletal system—one that can be used to identify children at risk of symptoms such as pain and pathology such as connective tissue disease and, as importantly, to reassure those who do not need further medical intervention . Bravo J. et al (2006) concluded that the Beighton score is an insufficient method for JHS diagnosis. They recommend that a validated hypermobility criteria set (i.e., the Brighton criteria or the Hospital del Mar criteria) be routinely used in the evaluation of rheumatology patients . According to Schubert-Hjalmarsson E et al (2012) pain appears to affect activity and participation in children with HMS. Balance is also increased compared with healthy controls . Fatoye F et al. concluded that pain and Quality of Life might form important components of clinical examination for children diagnosed with HMS. These children may benefit from appropriate treatment programmes to alleviate pain intensity and improve quality of life . ↑ Pasinato F., Souza J.A., Rodrigues Corrêa E.C., Toniolo da Silva A.M. Temporomandibular disorder and generalized joint hypermobility application of diagnostic criteria. Braz J Otorhinolaryngol. 2011;77(4):418-25. ↑ Russek L.N. Hypermobility Syndrome. Physical Therapy, Journal of the American Physical Therapy Association; 1999; 79:591-599. ↑ 9.0 9.1 Quatman C.E., Ford K.R., Myer G.D., Paterno M.V., Hewett T.E. The Effects of Gender and Maturational Status on Generalized Joint Laxity in Young Athletes. J Sci Med Sport. 2008 June; 11(3):257-263. ↑ 10.0 10.1 Evans A.M., Rome K., Peet L. The foot posture index, ankle lunge test, Beighton scale and the lower limb assessment score in healthy children - a reliability study. Journal of Foot and Ankle Research 2012, 5:1. ↑ Yazici M., Ataoglu S., Makarc S., Sari I., Erbilen E., Albayrak S., Yazici S., Uyan C. The relationship between echocardiographic features of mitral valve and elastic properties of aortic wall and beighton hypermobility score in patients with mitral valve prolapse. JPN Heart J, may 2004. ↑ Remvig L, Jensen DV, Ward RC. Are diagnostic criteria for general joint hypermobility and benign joint hypermobility syndrome based on reproducible and valid tests? A review of the literature. J Rheumatol. 2007; 34: 798–803. ↑ Boyle K.L., Witt P., Riegger-Krugh C. Intrarater and Interrater Reliability of the Beighton and Horan Joint Mobility Index. ↑ Smits – Engelsman B et al. Beighton score: a valid measure for generalized hypermobility in children. J Pediatr. 2011 Jan; 158(1): 119, 123. ↑ Schubert-Hjalmarsson E. et al. Pain, balance, activity, and participation in children with hypermobility syndrome. Pediatr Phys Ther. 2012: 24(4):339-44. ↑ Fatoye F. et al. Pain intensity and quality of life perception in children with hypermobility syndrome. Rheumatol Int. 2012 May; 32(5): 1277-84.